Robert Gober, "Double Sink," 1984. Promised Gift of the Donna and Howard Stone Collection, 2010. If you have been to a Friday night opening at Rhona Hoffman Gallery, or a lecture at the Museum of Contemporary Art on a Saturday afternoon, chances are you have seen Howard and Donna Stone there chatting with artists, curators and students alike. This month, an unusual confluence of events highlights the role that the Stones play as supporters of contemporary art practice in Chicago. With little pomp or publicity, each year the Stone Summer Theory Institute, sponsored by the couple, draws scholars from around the world to the School of the Art Institute of Chicago in hopes of answering sweeping questions about art, such as 2008’s theme “What is an image?” or 2009’s “What do artist’s know?” Art history is the main fare, but visiting scholars also include scientists, political theorists and philosophers. The topic for this year’s schedule of seminars and lectures is “Beyond the Aesthetic and the Anti-Aesthetic,” and one of the main speakers is critic and historian Hal Foster, who developed his theory of the “anti-aesthetic” in contemporary art in the 1980s. One example of Foster’s “anti-aesthetic” is now on view in the Modern Wing of the Art Institute, Robert Gober’s “Double Sink,” a 1984 sculpture owned by the Stones. “Double Sink” reexamines Marcel Duchamp’s modern-art icon, a urinal titled “Fountain,” 1917. 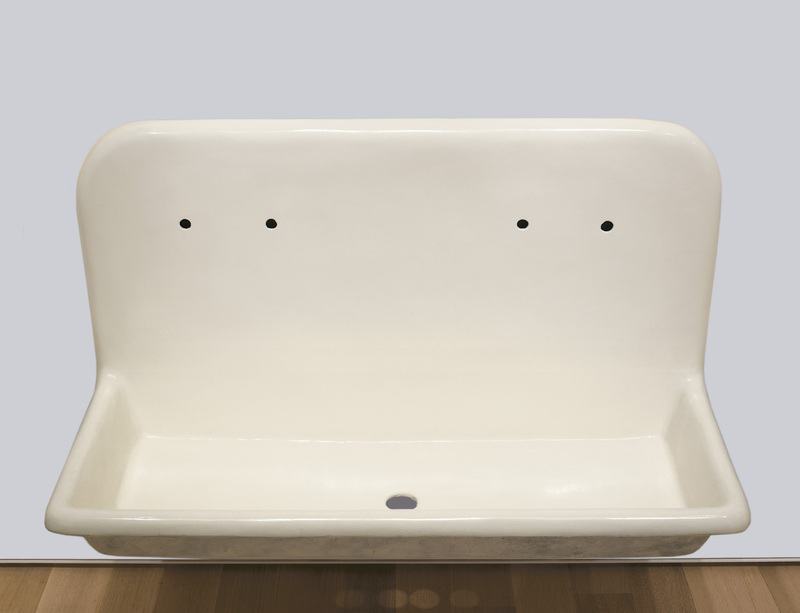 In a reversal of Duchamp’s “Fountain,” Gober’s “Double Sink” is handmade, even though its white enamel paint and large institutional scale makes it appear mass-produced or as fit for a kitchen as an art museum. Early criticisms of Gober in the 1990s cast his art as against modernism, but Hal Foster argued that, on the contrary, one had to deconstruct modernist ideas in order to recoup their cultural significance. This is just a taste of the discussions that will take place this week at the Theory Institute, with Hal Foster giving a keynote speech. Like many of the artists included in the Stones’ collection, Gober’s art references the work of previous generations. As the Art Institute’s curator of contemporary art James Rondeau noted in an interview, the Stones’ collection highlights the relationship between two generations of artists. “The collectors have a distinct relationship to Minimal and Conceptual works by artists like Fred Sandback, Dan Flavin, Robert Ryman, Robert Mangold and Sol LeWitt—the exhibition aims to show how these interests play out across generational lines. For example, the show includes the work of a younger generation of artists like Robert Gober, Roni Horn, Jim Hodges, Felix Gonzalez-Torres, and others whose work extends and expands on Minimal and Conceptual precedents.” Within the exhibition of the Stones’ collection what distinguishes this later generation of artists from the previous one is the intimate quality of their work. Many of the works in the Stones’ collection from this later generation of artists defy the largess that has become ubiquitous in much of the contemporary art shown at major museums today. Compare, for instance, the relatively small scale of the paintings and photographs in the Stones’ collection to the large-scale installations of Olafur Eliasson or William Kentridge, recently seen at the Museum of Contemporary Art. Works in the Stones’ collection from this later generation of artists draw the viewer physically close by their small scale, and maintain a conceptual intimacy by reminding viewers how to be bodily and mentally present in the world. Attesting to this are Janine Antoni’s photographic self-portrait where the artist embraces herself, and candy for take-away from Felix Gonzalez-Torres. Issues of display, as well as ownership and patronage, have recently swirled around the exhibition of artworks from private collections in public museums. Such private-collection exhibitions make artwork accessible to a broader public audience, but they also help to secure support from donors. When asked if the relationship between the museum and its donors had changed over time, particularly in light of the current economic downturn, Rondeau stated that the exhibition of the Stones’ collection had evolved over many years and was entirely in keeping with the museum’s relationship with its donors in the past. Top-shelf contemporary art is often out of reach for cash-strapped museums to acquire directly from dealers or auction, but with private collectors as intermediaries, such artwork can become publicly available to view. Although it has not been made public yet which works from the current exhibition of the Stones’ collection will be donated to the Art Institute, many works by contemporary artists such as Julia Fish and Thomas Struth have already been donated to the museum and are on view in other galleries of the Modern Wing.